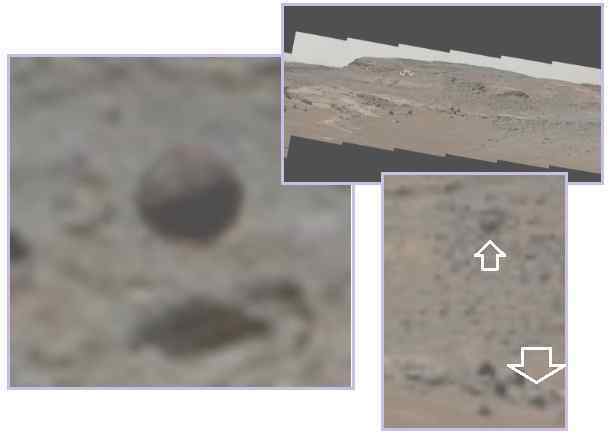 Is this a levitated sphere on the surface of Mars? Clearly it is almost a perfect circle, and the raw image capture by NASA shows more than one such sphere in the air. The light and shadow show this to be a rounded object, and what appears to be a shadow under one such sphere implies it is airborne. These are not water droplets on the camera lens. The spheres are close at hand, not at a distance - sand particles kicked up by the rover in motion. The apparent shadow is just a convenient shadow at a distance, else why would this one sphere have a shadow on the ground while the others do not? Lately the weather has gone wild. There was a heatwave in Pakistan and now there is a heatwave in Iran. 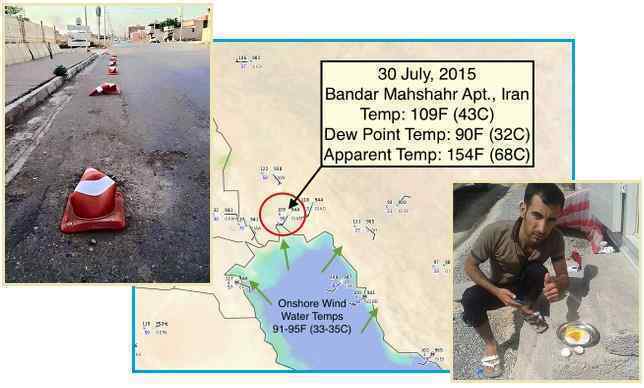 "The city of Bandar Mahshahr, Iran has reached an incredible 163 F (73 C) (Temp: 109F (43C) Dew Point: 90F (32C))." And this maps below shows the temperatures on August 4, 2 meters above the ground. Could the Zetas say something about this, as it seems like a change in the wobble or some kind of tilt.? [and from another] http://strangesounds.org/2015/08/iran-is-literally-melting-amazing-163-f-73-c-in-bandar-mahshahr.html People can cook their eggs under the sun. [and from another] http://www.telegraph.co.uk/news/worldnews/middleeast/iran/11777843/Scorching-heat-dome-over-Middle-East-makes-it-feel-like-162F-in-Iran.html The word "hot" has taken on an entirely new meaning in Iran's city of Bandar Mahshahr, where it was claimed that the city's heat index, or "feels-like temperature", was among the highest ever recorded. It is just a few degrees lower than the highest ever recorded heat index, which was 178F (81C) in Dhahran, Saudi Arabia on July 8, 2003. Scorching heat levels of 50C have already paralysed nearby Iraq, where officials were forced to call a four day public holiday because it was too hot to work. The heat index was recorded by a group of astonished weather experts who predict the country could be enduring some of the hottest urban temperatures ever endured by mankind. The dome - a type of high pressure ridge that is passing over the region - has exacerbated electricity and water supply issues and makes the scorching heat even more unbearable. Highest ever temperatures: 56.7C at Greenland Ranch, Death Valley, California, USA on July 10 1913 [and from another] http://www.bbc.com/news/world-asia-33236067 As temperatures reached 45C (113F), Pakistan's PM Nawaz Sharif called for emergency measures and the army was deploying to help set up heat stroke centres. There is anger among local residents at the authorities because power cuts have restricted the use of air-conditioning units and fan. Matters have been made worse by the widespread abstention from water during daylight hours during the fasting month of Ramadan. The all-time highest temperature reached in Karachi is 47C, recorded in 1979. Last month, nearly 1,700 people died in a heatwave in neighbouring India. [and from another] http://meteociel.fr/modeles/gfse_3d.php?mode=4&lat=85.29&lo [and from another] http://www.accuweather.com/en/weather-blogs/climatechange/update-on-climate-change-impac/50724748 [and from another] http://www.weather.com/forecast/news/europe-heat-wave-record-highs-june-july-2015 The culprit for this heat wave was an area of high-pressure aloft nosing northeastward from the Iberian peninsula into parts of northern Europe. Under this dome of high pressure aloft, dry, sinking air and generally light winds allowed stifling heat to build. [and from another] http://www.usnews.com/news/science/news/articles/2015/07/20/another-month-another-global-heat-record-broken-by-far June was warm nearly all over the world, with exceptional heat in Spain, Austria, parts of Asia, Australia and South America. Southern Pakistan had a June heat wave. In May, a heat wave in India claimed more than 2,000 lives and ranked as the fifth deadliest on record. Earth has broken monthly heat records 25 times since the year 2000, but hasn't broken a monthly cold record since 1916. [and from another] http://www.bloomberg.com/news/features/2015-04-17/this-has-been-the-hottest-start-to-a-year-on-record The heat was experienced differently across the world. People in the U.S. and Canadian Northeast had an unusually cool March. But vast swaths of unusually warm weather covered much of the globe, and records were broken from California to Australia. 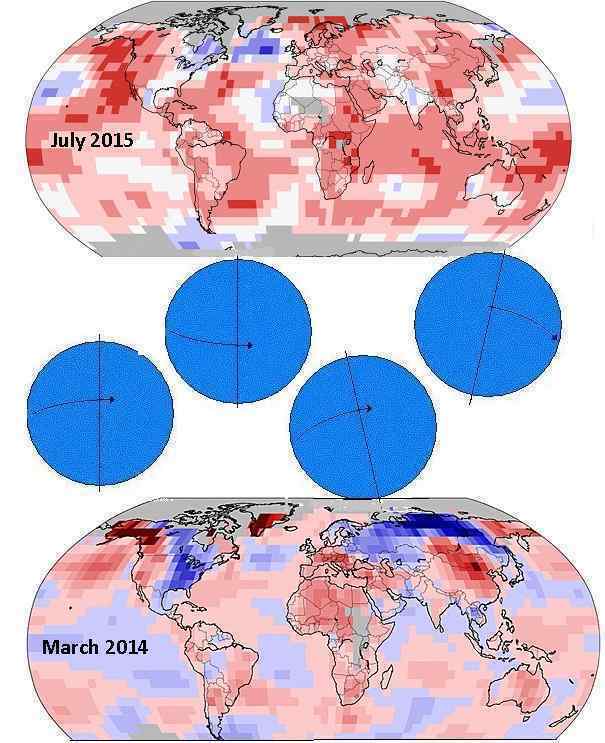 Comparing the heat map from 2014 to 2015, one can see that heat has increased across the globe. These maps are showing the variance from average temps for the time of year, not the temps themselves, thus the fact that the 2014 map was taken in March and the 2015 map in July is irrelevant. The reason so much of the habitable globe - the temperate and tropical zones - are showing this increase overall is due to a change in the Earth wobble. The daily Figure 8 is still in process, but the tilt to one side and then the other have become more extreme, thus laying the habitable parts of the globe under more intense sun for a longer period of time. Tilt to the Right: In 2014 heat increased in China as it was exposed to more sunlight when the magnetic N Pole tilts to the right. This heat increase is still there for China in 2015 and has increased to include the Indian ocean and the ocean to the east of Australia. In 2015 the tilt to the right has become more extreme and thus an Equatorial sun is blasting a larger part of the globe. Tilt to the Left: In 2014 heat increased in Europe when it was exposed to more sunlight and was under a high pressure dome when the magnetic N Pole tilted to the left. This is still the situation in 2015. Polar Push: In 2014 both Russia and Siberia were registering more cold as the Polar Push had gotten more extreme. Russia and Siberia spend more time with less sunlight, thus. In 2015 this has changed, as the Polar Push has given way to a more extreme tilt to this or that side, which effectively hides the magnetic N Pole of Earth from the blast of magnetons from Nibiru’s N Pole. Polar Vortex: In 2014 eastern US and Canada had endured a Polar Vortex winter as this part of the globe is on the opposite side of the globe from Siberia, where the magnetic N Pole now resides. When the Polar Push occurred, noon over the eastern Pacific, N America was pushed under Arctic air. In 2015 this Polar Push had eased, as the tilt to the right and left had increased instead. But cold still flows from the Arctic as the more violent and extreme tilt to the left is pushing Quebec under Arctic air and forcing a daily gush of cold ocean currents around the sides of Greenland. What was discussed at the ASEAN summit on the background of floods in South Asia? We can also note the positive trends in Indonesia, where they elected a new president in 2014. 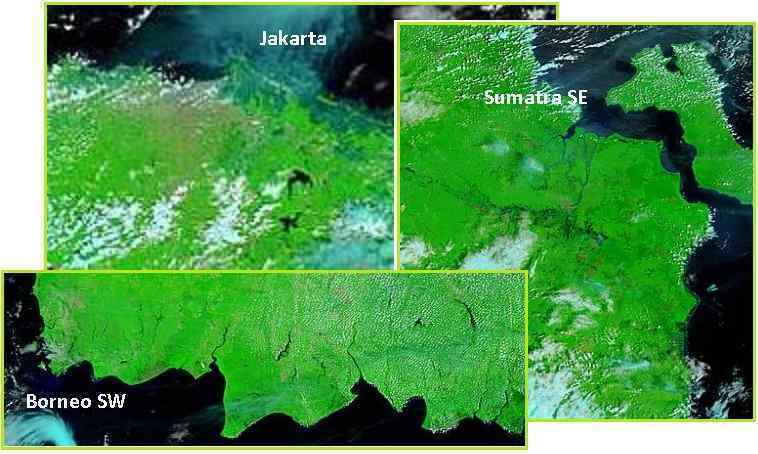 It seems they plan to move the capital due the endless flood that came down on Jakarta each year. Can the Zetas comment if need it? The Zetas have stated that the process of sinking Sunda plate is completed only by 95%. 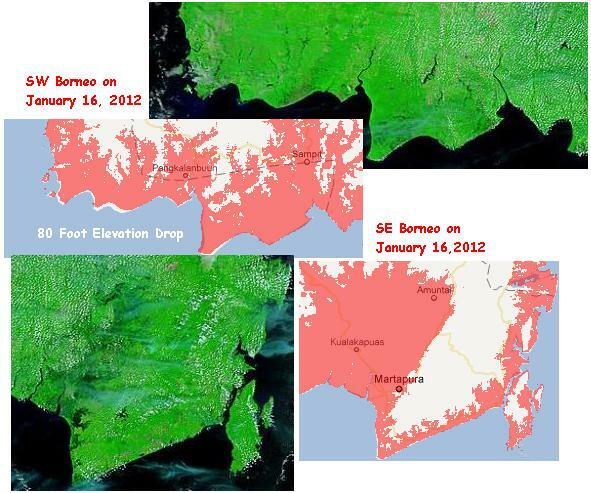 Can we expect that the floods will not recede ever? The question is what to expect when we reach 100%? I think there was a lot of not understanding, due to the fact that the pace was slow. For example despite the fact the invasion of sea water into the river Indus in Pakistan in 2010, the flood waters receded. (However, after half a year.) 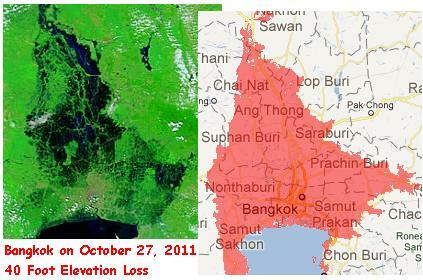 In other words, although the flood waters linger, sooner or later recede as show MODIS. In short it should expect the inhabitants of these countries? 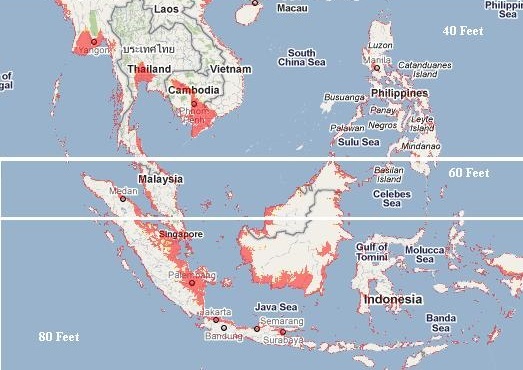 This map shows the sum of all admittedly flooded areas; in Sunda region (Myanmar, Thailand, Cambodia, Vietnam, China, Philippines, Malaysia, Southern Indonesia edge, Singapore, Brunei) since 2010 and in South Asia since 2007 (India, Pakistan, Bangladesh, Nepal). Red it's extent of floodwater, now dry. [and from another] http://www.thejakartapost.com/news/2015/08/06/asia-backs-iran-deal-kerry-says-a-bomb-anniversary-relevant.html The 10 members of the Association of Southeast Asian Nations and five of their large neighbors endorsed the nuclear deal negotiated between Iran and six world powers. In a joint statement, the foreign ministers of the ASEAN countries along with Australia, India, Japan, New Zealand and South Korea welcomed the deal with Iran struck last month as an "important resolution" that could resolve one of the world's most pressing concerns if it is adhered to. ASEAN includes Brunei, Cambodia, Indonesia, Laos, Malaysia, Myanmar, Singapore, Thailand, the Philippines and Vietnam. Also signing the statement were China, Russia and the United States, which were involved in negotiating the agreement with Iran. [and from another] http://www.reuters.com/article/2015/08/05/us-myanmar-storm-idUSKCN0QA0Q320150805 Water rises dangerously in flood-hit Myanmar's delta; U.S. to help. Speaking in Kuala Lumpur, Kerry said that the U.S. embassy in Yangon was working closely with Myanmar officials to determine priorities for aid. [and from another] http://www.merdeka.com/peristiwa/pemerintah-jokowi-mau-pindahkan-ibukota-ke-sampit-atau-pangkalan-bun.html Government Jokowi still preparing the transfer of the capital city of Jakarta Special Capital Region to another city. The government calls Borneo island become an ideal place for the transfer of the national capital. Since the era of President Sukarno, had been under consideration in 1957 that the city of Palangkaraya, Central Kalimantan, as the transfer of the capital city of Jakarta. Minister for National Development Planning / Head of National Development Planning Agency Andrinof Chaniago revealed Palangkaraya no longer worthy to be the capital because the carrying capacity of the land is not adequate. [and from another] http://www.theglobeandmail.com/report-on-business/international-business/asian-pacific-business/the-next-china-indonesia-emerging-as-a-new-asian-powerhouse/article22496882/ The next China? Indonesia emerging as a new Asian powerhouse. Indonesia is experiencing a burst of unprecedented economic and political optimism. The world’s fourth most populous country, with some 250 million people, is emerging as a powerhouse of Southeast Asia, at the dawn of an awakening that many compare to pre-boom China three decades ago. 7 of 10 was an extreme threat to countries on the Sunda Plate. Indonesia, Malaysia, Cambodia, Viet Nam, Thailand – all were loath to confess to their populace that soggy lands being inundated by sea water was not only a permanent blow, but that the situation would worsen with the passage of Nibiru. Flooding was blamed on rain, despite the incursion of sea water. Sea walls were strengthened and villages relocated, and any honest reporting by journalists suppressed. 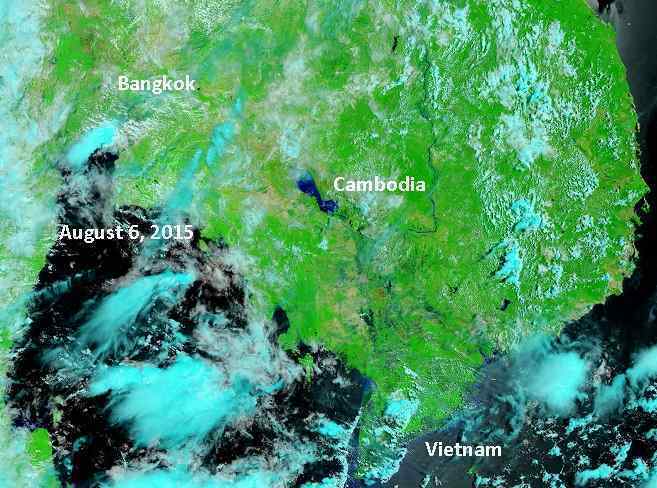 In that Nancy was using MODIS satellite images to prove her point, and did so dramatically by early 2012 in Issue 283 of her newsletter, the southeast Asian countries wanting to suppress awareness of what was to come sought to modify the MODIS story. 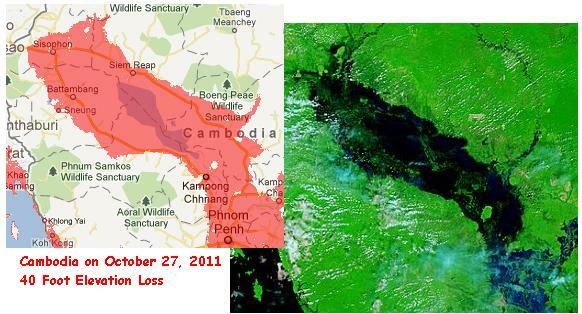 By early 2012 MODIS was showing sinking in Bangkok, Viet Nam, and Cambodia to the level we predicted – a loss of 40 feet. Bangkok in particular, being a tourist attraction, was frantic to reverse the perception that they were sinking. The recent admission that Bangkok is sinking and may be under water in 15 years is an attempt to connect their brave front with reality. 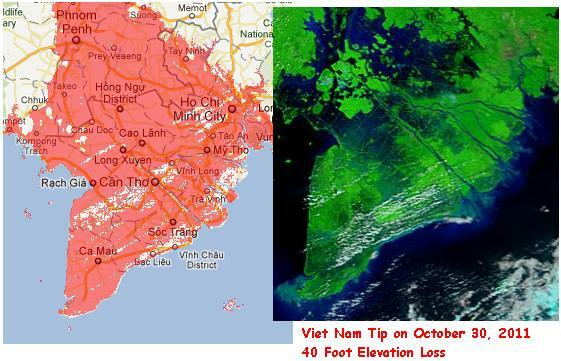 In order for MODIS to reflect a false land mass under a changing cloud cover for Thailand, this needed to be put into place for neighboring Cambodia and Viet Nam too. Yet the flooded Myanmar Delta now requires international aid. Such is the living lie. 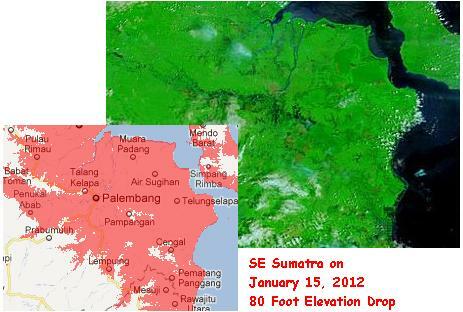 Further south, where Jakarta was having serious problems with sinking, a similar story was developed. The city streets of Jakarta were awash, pumps attempting to push the water over sea walls, and where this news was denied as anything but a problem with rain swollen rivers, photos from air travelers proved otherwise. 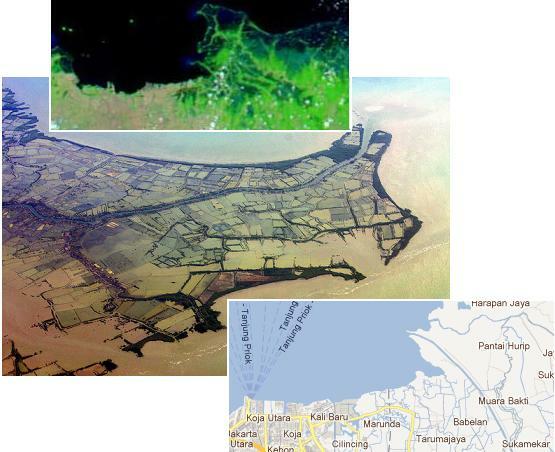 Reports were floated that Jakarta was sinking only because aquifers were being drained by city dwellers, and experts were called in from the Netherlands to help strengthen the dykes. Indonesia opted not to deny what had already been in the press or in Nancy’s newsletters, but the sinking story as presented in MODIS was frozen at the early 2012 level. Yet we hear that Jakarta must move to Borneo and the Kuala Lumpur new airport, which is in the sinking zone, has now become a disaster. Construction on this new airport was started in 2009, ahead of when our 7 of 10 sinking predictions became public in 2010. 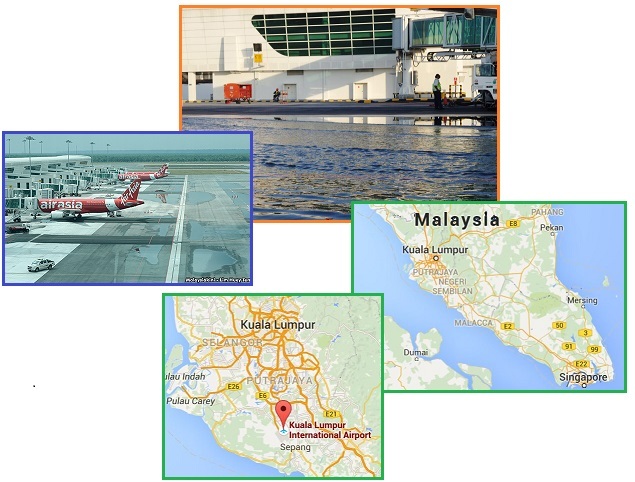 Now in 2015 the sinking has made using the airport nearly impossible, due to constant puddles on the runways. Will the future bring more honesty? We are told, in the press, that Indonesia is the next China, an economic miracle about to flourish. With no country willing to take immigrants from Indonesia, such will continue as the living lie.